These square luggage tags are made from a fiber reinforced plastic; they are UV resistant, waterproof and durable enough for everyday use or for the travel demands of the wanderlust warrior!. The tag is decorated on both sides, usually with a design & some form of personalization on the front and contact information on the back. Bought this as a gift and she loved it!!! Love it! Looks very formal and pretty! I bought this for a guy, I think he will love it! Solves the troubles at the airport when rushing. Sturdy material, but I prefer a metal fastener so I bought those separately. A lot of different designs to choose from that you can play with before you make your final decision. These are very pretty tags, and I love how you can customize many features. They stand out at an airport, so I don't need to worry about using my black suitcases. They are very thin wood, so I hope they hold up over time. The product appealed to me because it's different. The quality is superb!! 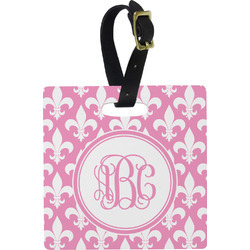 The third party company's website makes designing the tags easy and fast. I'm ordering more for friends who have seen mine. 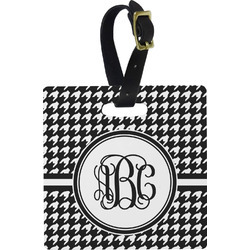 This luggage tag is attractive and durable so far. I have only gone on one trip with it.